Our products support Markdown for presentational text fields in Zengine and Portals. 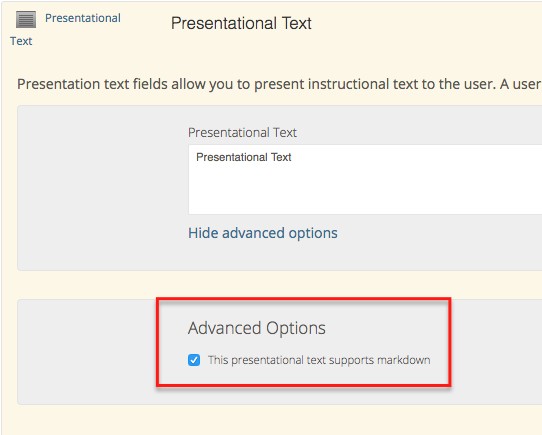 To enable Markdown text in an eligible field, open the Form Builder > Presentation Field > Show advanced options > Check the box "This presentational text supports markdown". Actual numbers don't matter, just that it's a number. NOTE: Links must begin with HTTPS to work. HTTP is not supported. Here is a line for us to start with. This line is only separated by a single newline, so it is a separate line in the *same paragraph*. Can I use this in other locations throughout my Zengine? Currently, Markdown language is only available for Presentational Text fields.